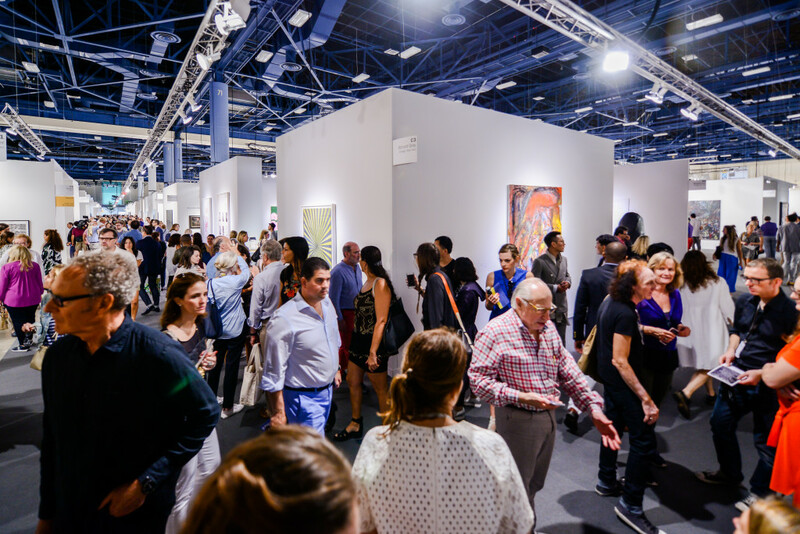 It’s big and getting bigger — Art Basel Miami, the imported fair that has revitalized the South Florida and international art scene is running through Dec. 4 at the Miami Beach Convention Center. Outside the doors of the main fair there are dozens of satellite fairs, parties, outdoor art parks, parades, film, and some extreme fashion this year. The main fair itself has 269 leading galleries from North America, Latin America, Europe, Asia and Africa showing significant work from the masters of modern and contemporary art, as well the new generation of emerging stars. The booths in the main hall are the attraction with top tier, mind-blowing works from the best of the best in the world. Rauschenbergs sit next to Picassos, celebrities form the worlds of film, sports and music rub elbows with billionaire collectors, artists generally get by unnoticed. In addition to the booths, the fair hosts specially curated sections including Nova. Designed for galleries to present one, two or three artists showing works created within the last three years, the Nova sector features strong juxtapositions and never-before-seen pieces fresh from the artist’s studio. Look for a 360-degree projected video environment by Taro Izumi at Take Ninagawa gallery this year. 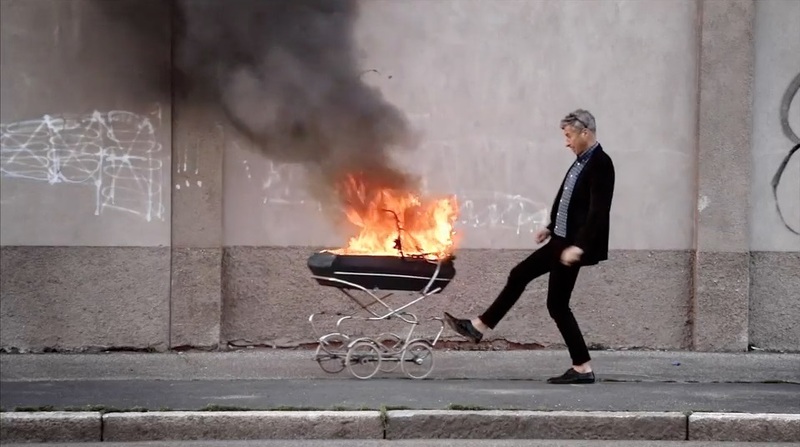 Maurizio Cattelan, in Be Right Back. 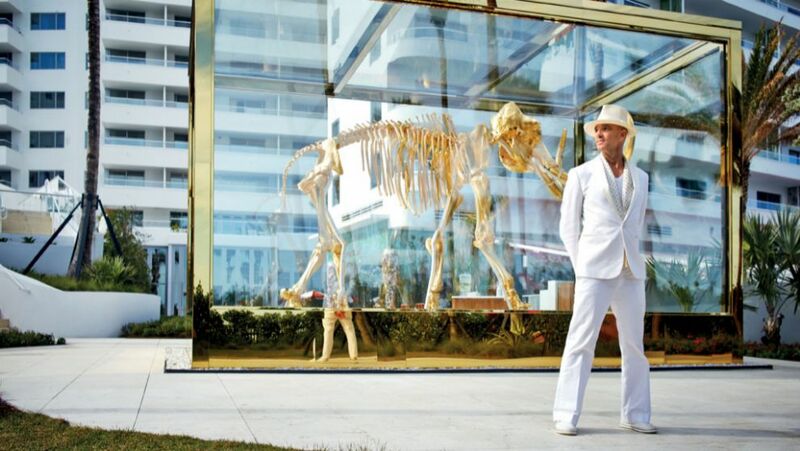 Alan Faena in front of a Damien Hirst sculpture. Faena Art: A billionaire Argentinian couple have created an entire mini neighborhood for themselves in Miami Beach called Faena with a hotel, condos, a theater. Now Ximena Caminos and Alan Faena launch Faena Art with a big opening program beginning Sunday from 3 to 6 p.m., featuring a large-scale public performance called Tide by Side that will fill Collins Avenue on Miami Beach between 32nd and 36th Street. Claire Tancons is the event’s artistic director, along with musical director Arto Lindsay and architectural director Gia Wolff; plus several other artists and performers including Damian Rojo, Carlos Betancourt and the Miami Gay Men’s Chorus. It’s sure to be a wild parade with floats, costumes and unexpected art related events. Free and open to everybody. Art collector and pop star Madonna is doing an evening of “music, art, mischief and live performance” to benefit her charity Raising Malawi on Friday, Dec. 2, in the Faena Forum (32nd Street and Collins Ave., Miami Beach). There will also be special guest appearances by funny man Chris Rock, Ariana Grande and Madge’s ex Sean Penn; plus James Corden of The Late Late Show and carpool karaoke fame is the master of ceremonies. Only 400 tickets will be available and the cheapest ticket is $5,000. Fashion art: Cutting-edge fashion takes center stage as American style icon, Emmy winner and fashion designer Pat Field makes her Miami Art Week debut with an exhibition of a collection of one-of-a-kind pieces by eight artists. The show will be up for all of December at the White Dot Gallery (174 NW 23rd St., Miami) in Wynwood. Field hand-picked all the participants including Suzanne Mallouk, former paramour of the late art star Jean-Michel Basquiat, whose painted leather dresses and jackets address issue of feminism and maternity. MANA Wynwood and the PINTA Miami Art Fair are teaming up to host an invite-only, “live” performance of Bill Viola‘s video/sound installation titled Inverted Birth (2014) on Tuesday at 7:30 p.m. The film will be accompanied by the Orchestra PhilarMIA and dancers from the Miami City Ballet and Bill Viola will be present. The 10th edition of PINTA runs from Nov. 30 to Dec. 4 in MANA Wynwood (2217 NW 5th Avenue, Miami) and features 50 galleries with a special focus on Latin American, Spanish and Portuguese art. 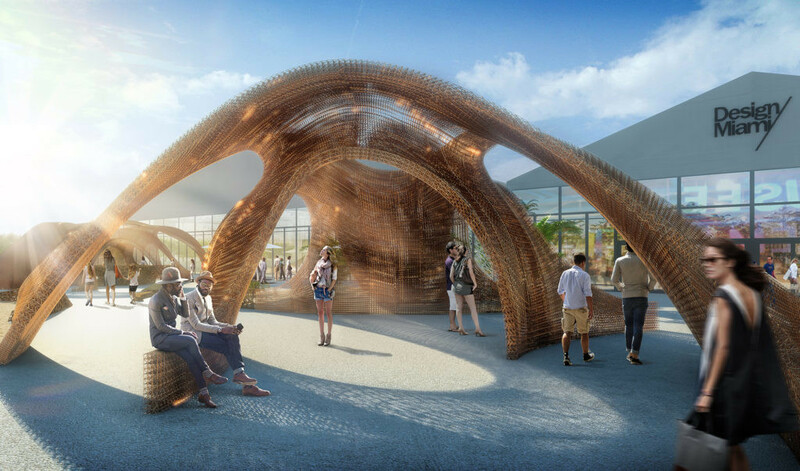 Flotsam & Jetsam plaza, by SHoP Architects. A sculpture by Ugo Rondinone in Collins Park outside The Bass. The Bass Museum unveils its $12 million expansion project on December 1st after 18 months of construction. The Japanese design consultant Arata Isozaki, in consultation with the architect David Gauld, was asked to expand the museum’s exhibitions and programming space “without adding square footage to the building,” according to a statement from the museum. The museum has also shortened its name from the Bass Museum of Art to simply The Bass, and has revamped its logo and website. The Bass will inaugurate the new space with three exhibitions, including the first solo museum show of works by the Swiss-born artist Ugo Rondinone, titled Good Evening Beautiful Blue (until March 27). 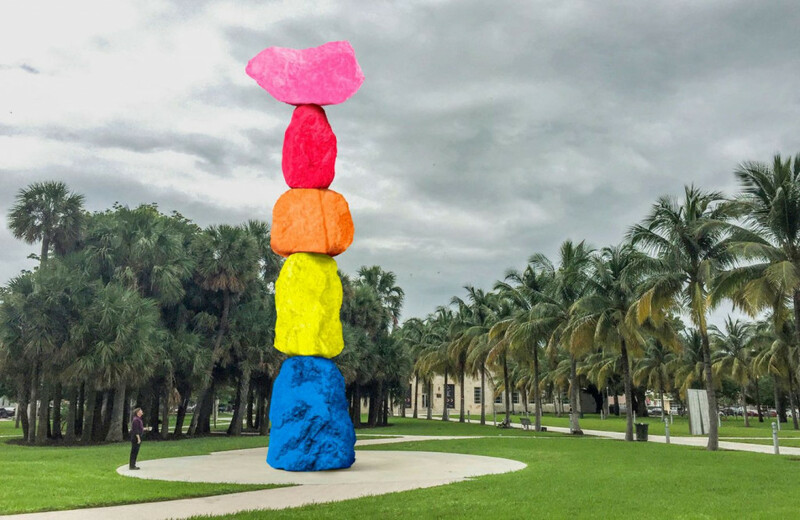 This exhibit takes up three galleries and includes a video installation and one sculptural installation titled Vocabulary of Solitude (2016) that involves 45 sculptures of clowns positioned doing everyday tasks such as “wake, sit, walk and shower.” There is a huge new totem sculpture by Rondinone in Collins Park outside The Bass.